The fireplace in our family room has the same stone, and I love how it looks. I think your fireplace feels off because whoever did the stonework used the stone from the fireplace on the built-in to the left. I don’t know how you could remove it from the built-in shelves without messing it up on the fireplace. I really like the picture from Carpenter and MacNeille. I also wanted to say… I am sooo jealous that you have two fireplaces!!! Yes, I’m happy about having two fireplaces, too! :) Thanks, Loribeth! Hi Melissa! What fun decisions to make. The horizontal white boards in the photo of Beneath My Heart and the ones at your former home are wonderful. To do that again would be really nice, but would you take them all the way to the left over the shelving? And then the photo from Magnolia Market gives a good idea for what to do with shelving on the side. And here I am hopping around with my ideas, sorry. But it would be better, if the wood didn’t go all the way to the wall of your present fireplace. Maybe I just can’t picture it. But, what I really, really liked was the Crisp Architects photo with the barnwood sliding doors with the beadboard. Rustic, yet modern. And I agree with Loribeth that the stone going on to the left is maybe throwing things off. Can’t quite put it in designer terms. Just a visual feeling. Thanks so much for sharing. It was fun! I also wanted to tell you that the photo from Carpenter and MacNeille shows a great thing with the doors hiding the shelves. Then the stone shelves could stay, thus cutting down on demo. I love real, wood burning fireplaces! Lucky you! All you inspiration pics were great but the one that stood out for me was the example from Crisp Architects minus the sliding barn doors. A clever way to hide a tv but a bit overwhelming and I think took away from the mantle itself. I love the idea of a stone fp but I think the stone on yours is, dare I say it, a little swine-ish. ? I’m hoping it is just the picture but if not there are a lot of other beautiful stones out there that you could choose from to re-do the surround. My husband and I just did our (Canadian) cottage fp in a granite that came from New York. It has a lot of greys which I think would suit your colour preferences more. Our local granite had way to much pink (re:swine) in it for me! Lol! Clearly I’ve been following your blog for some time now! I will send some pics of our nearly completed fp to your regular email as I am not techy enough to know how to attach them here (and none of my children are home to show me). Whatever you decide to do I know will be lovely! Can’t wait to see it! Ha! It is swine. Especially the grout! You know me well, I didn’t even have to say it. :) Thanks for your ideas and I would love to see your pics :). Thanks for your ideas! I also like the Carpenter McNeille fireplace styling for yours. I agree, those stone shelves have got to go. Then build out your fireplace surround to balance the lopsided stone work and add more appropriate built ins. And the gold bar across the top, I’d also like to see it gone or disguised if it must stay. Great inspiration photos. Food for thought. I absolutely think the only surround for a proper fireplace is the one you have! Stone can be so contemporary or traditional. I would not paint it, although the panted stone looks better than the painted brick. I have thought about painting my wood burning stove brick surround a different color to brighten it up, but ultimately think I may regret it. The surrounding of the stone is where I would focus my attention. you are so lucky to have a fireplace. We have a stove for heating purposes and it works beautifully. However, I would much prefer a fireplace, but it would look silly in one large open room to have both …any thought on that? 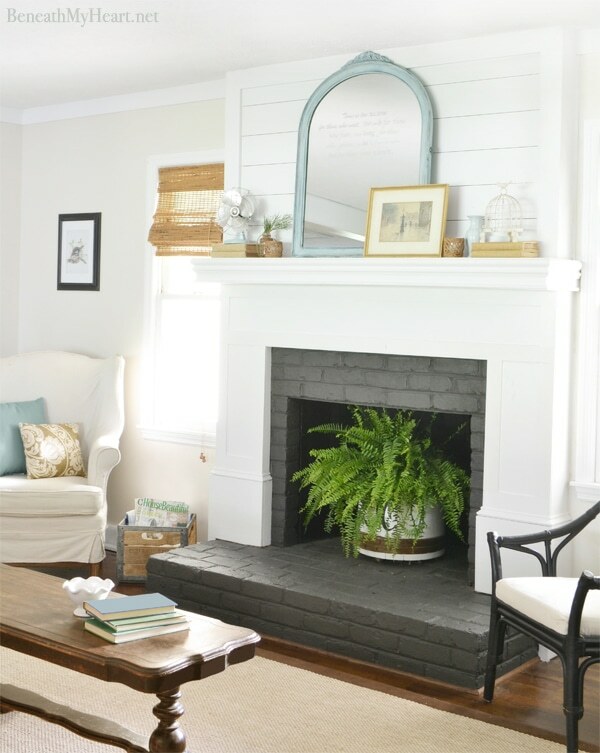 That fireplace with the brick painted charcoal – I really like it. It will be interesting to see what you do. All the fireplaces are really nice. Love two fireplaces, the house I grew up in had two and it was great. Your upper fireplace needs to have the brick shelves taken out. Like to see wood around the brick and wooden bookshelves put in. 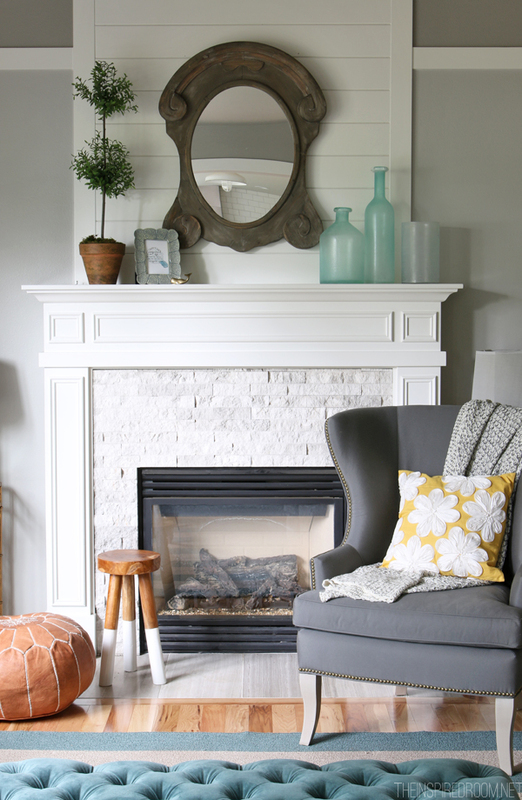 I am totally on board with painting fireplaces! I convinced my dad to do it in the house he’s had for 35 years and the transformation was amazing. I have the same stone on one of my fireplaces too. And my friend does in her house too although she painted hers white recently. I think a builder in Seattle must have got a discount on that stone and scattered that fireplace all over. Good luck with the changes! Yes, demo-ing the left side of the fireplace would mess with the stone on the left side a little. But, if you add a wood surround, it would hide all that. Plus, the fireplace opening isn’t quite centered in the stone facade and a wood surround would take care of that. Then, the FP would be centered in the room and be the perfect focal point. I don’t think built-ins on the sides, taking the window on the right into consideration. Sizing the surround of the FP would be “key.” Maybe even bringing in wood above the FP surround, mantel, bringing the eye up (raising the ceiling and making FP more grand). Ooooh, the possibilities bring itchy fingers! I can’t wait to see what you end up doing! I like the one by Carpenter and MacNeille and you could still do ship lap above the fireplace which would really make a statement. I noticed that all the rock fireplaces that you posted for inspiration have a gray color. I think I’d paint it a mixture of grays and whites and add something above just the fireplace part to make it taller and look more massive. The planking would work, but its being done so much right now, I’d veer away from planking and probably use more stone. Anxious to see what you do! Oh my gosh! I hadn’t really looked at your fireplace closely, but now that I have, I can see that it’s the same stone and shelf application that was in my parents’ old house on QA. Those stone shelves damage books and other things like crazy (and the color of the stone is not that great, although yours looks less pink/swine-like than theirs). They ripped out the shelves and put in custom wood built-ins in the den, leaving the stone surround. In the living room all the stone was replaced by a traditional paneled wood mantel. In the kitchen, they painted the stone all white and it looked great. I bet the same contractor was involved on both houses. Theirs was owned by a family big in home construction, who remodeled it extensively around the time that your house was probably built. And why anyone would do this stone thing on every fireplace in a big QA dutch colonial always mystified us. Ah, yes! I wonder if it was the same contractor or just a THING everyone was doing back then. Glad your parents found a solution, I have hope I’ll find something that will work for mine! Great inspiration photos! 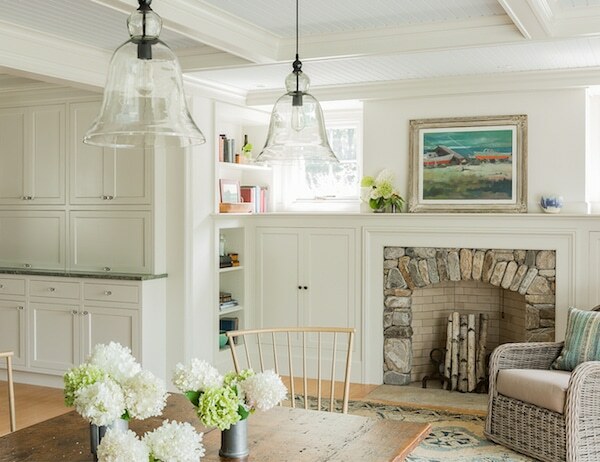 I think getting rid of the stone shelving, replacing with painted wood shelving in cream or white and building them up to,the height of the window on the opposite side of your fireplace. Mid leave the stone surround on the fireplace natural as is but build a wood mantle surround painted the same color ( semi- gloss) as the bookshelves. I would also remove the dated FP screen (that brass band is dated) and put in a new one or just leave it open. By building the shelves to,the height of the window on other supine and applying a painted wood mantel surround ( leaving a bit if the stone exposed) would not only center your,natural focal point in your I’m, but also balances the whole thing better ( height wise in the room since you only have shelving on one side and a window on the other. Have fun dreaming of your options. Can’t wait to see what you do! I know it’ll be beautiful. Thanks, Jo Jo! I can’t wait either :). Loved two of the pics. Carpenter and McNeille’s and Emily Henderson – for a good reason. In my own living room the mantle is low, like those two, and I really like that height. I don’t think it would be too hard to get rid of those silly one sided shelves? It might be a bit messy, but it could be done. Then, if the fireplace is already centred, it will give you what you want. I don’t have cupboards each side of mine (can’t have built-ins in an old house with no damp course), but if you like them, they would look good – and could you afford to have a window cut on the left side too? Hi Susan, yes I think height might be a really good idea for this space. And definitely need to figure out a solution for centering the fireplace, too. It’s a design puzzle, but it is fun to be trying to solve it! Thanks for the fireplace inspiration! Melissa! I love that you’re posting about painted fireplaces! We bought our 1st house together last Spring & it has THREE! fireplaces! All of them were in need a makeover (surrounds, hearths are all cream blah tile, dark wood LARGE mantels on all of them). I had been itching to paint a fireplace white since we lived in our rental so when we moved in I knew right away I was going to do it on at least one of ours. I finally took the leap awhile back and painted the one in our sitting room/my office & I LOVE IT! I know several people cringed when I told them my plans because the house is over a 100 years old & the mantels are probably close to that too. But I didn’t care. I crave natural light & bright rooms & that is exactly what my office needed. I primed and painted to my heart’s content, mantel, brick surround and all. No regrets! Can’t wait to see all of your inspirations come together in your new home! Great inspiration pics. My favourites are by Crisp Architects and Ballard Designs. They keep the beautiful stone but either topped it with a substantial mantel or complete surround. 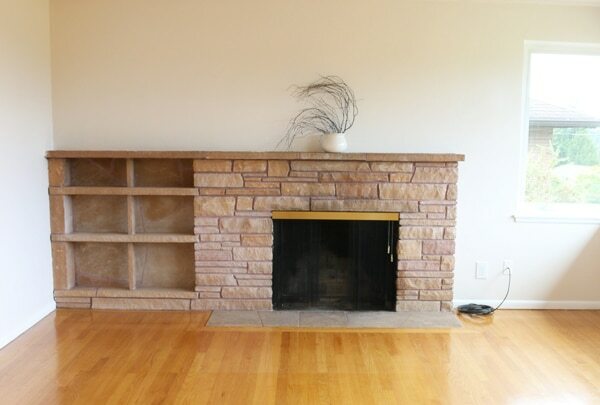 What I believe dates your fireplace the most is the stone bookcase /shelves beside it. I like the painted brick fireplaces but I think your stone is lovely. 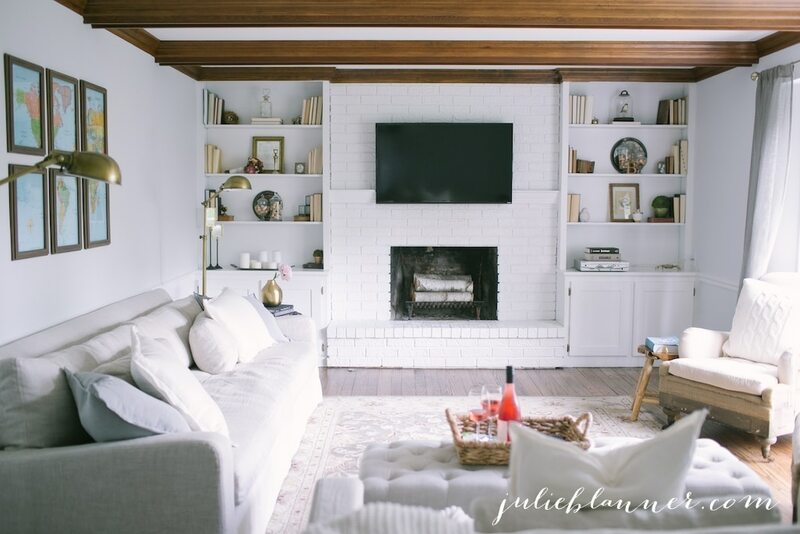 I never thought I’d like a white fireplace, but that one looks gorgeous! All of the ideas above sound tantalizing! 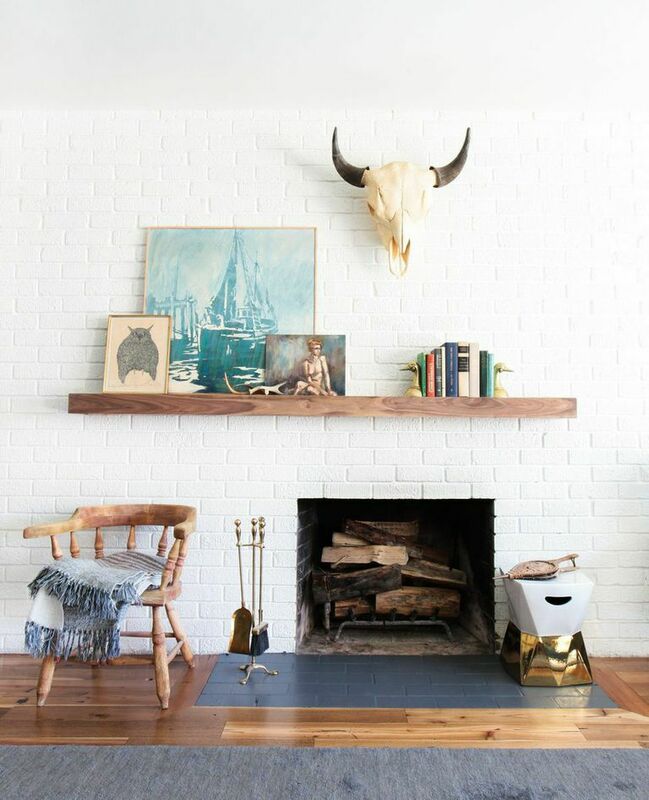 I have two white-painted brick fireplaces in my home, and I love them. They were already painted when we moved in, and that was fine with me! I think the type of stone and the design of yours is very mid-century modern (and yes, the color is a bit swine-ish as other commenters have mentioned!). 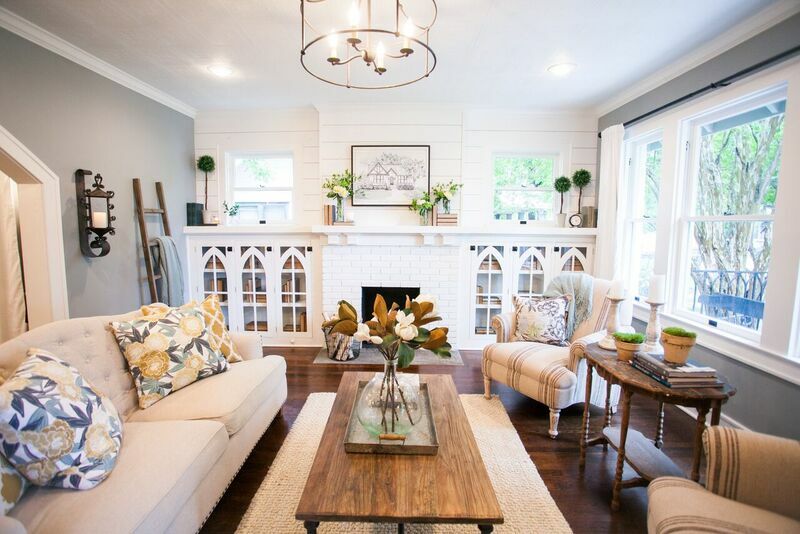 If you’re going for your lovely signature Melissa style, I think building a white-painted wood surround with white shiplap from the mantel to the ceiling would give height to the room and amplify the light and bright feel that the room already has. 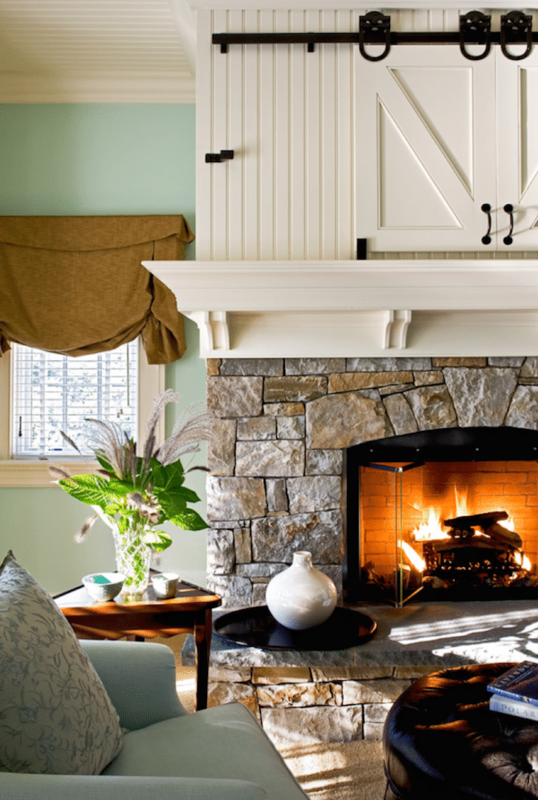 You can just build right over the existing fireplace–a very cost-effective move. And maybe many years from now, the next family to own the home might uncover the original and be inspired to bring back the mid-century style! That’s true, it could be covered! And I do love the idea of height and amplifying the light. So many great ideas, thank you, Debby! I’m so glad to hear you feel inspired and helped, thank you! I agree, decisions can be quite overwhelming sometimes so I’m happy when I can pare down possibilities. :) Thank you, Kathryn! Fred Flintstone called. He wants his shelves back. 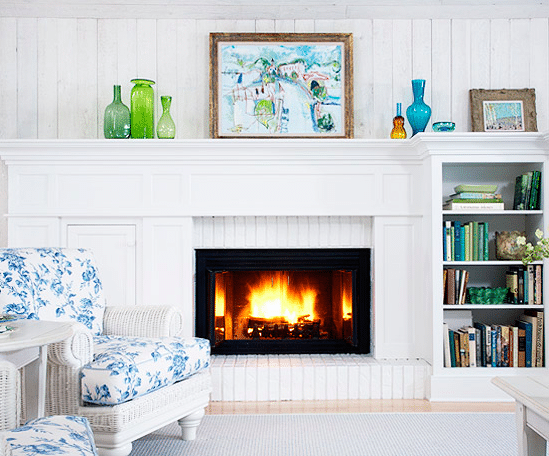 Seriously, I agree with Kathy Harris, add painted wood cabinetry to help center your fireplace. Love all the inspiration photos. They give you so many budget friendly options. Jealous. I would love to update my corner monster. It is swine brick with raised hearth and recessed brick mantle. There are so few inspirations for a corner fireplace out there. Help! That mid-century asymmetrical style sure leaves a person feeling off-balance :) You will make it look wonderful! You are a genius and I love watching. I guess MCM is kind of unpopular here, and I totally think you should do what you want with your own home. But I just had to chime in and say I can picture the asymmetrical features as a positive, like in the cool Emily Henderson photo. I have painted two fireplaces and what a difference it makes when you paint them. I recently painted one with a product called Brick-Anew and it’s a fantastic product! Good luck with your stone fireplace. I really like the shelves that are attached and I’m sure whatever you decide to go with will look great! 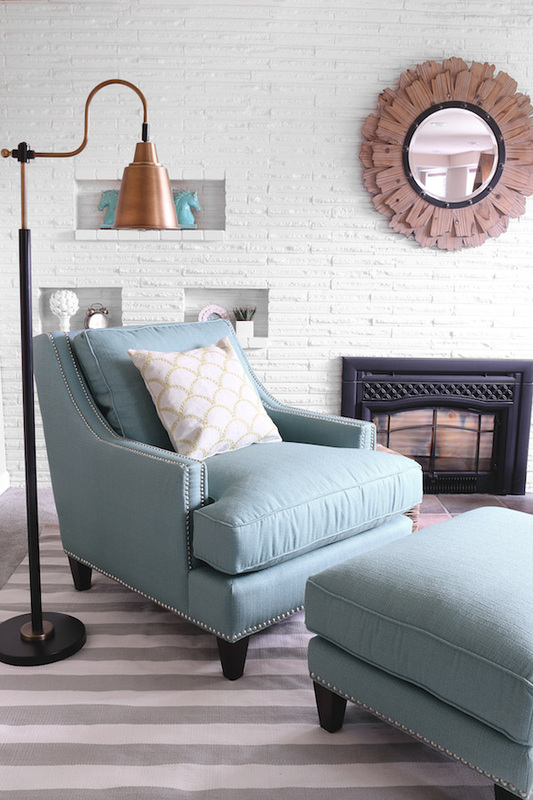 I love the inspiration photos and I can’t wait to see what you come up with for your fireplace. It will be just right when it’s all done. Our fireplace had swine bricks (fireplace and hearth) with swine mortar (to match the swine carpet, walls and lined drapes!). We completely redid ours – painted the brick and added a gorgeous surround and mantel that are also painted white. Everyone comments on our beautiful fireplace when they come to visit. We love it and have never regretted one decision we made to paint the bricks or make it all look new. Yours will be wonderful when it’s finished! Hi Melissa! I love how you take input from your readers into consideration. I thought of two things while reading this. You’ve probably already thought of these things but just in case… One – I really prefer symmetry in a fireplace, mantel, and what flanks its sides. Or at least the visual weight to be balanced. To me that’s why your fireplace on the main floor feels off. It’s visual weight is heavily leaning toward the left because of all the stone. Pretty much all your photos for comparison have this symmetry and visually equal weight in their favor. So whatever it takes to create that in your space will probably be worth it. Two – it looks like your ceiling height is much lower in this house than your last one which is one of the main reasons I like the Carpenter and MacNeille photo best for comparison. They’ve used that to their advantage and created such a cozy welcoming space. Whatever you do I’m sure it’ll be awesome as I tend to love all your ideas. I hope this helps! Thanks, I think that one is my favorite, too! I’m hoping for the same result, cozy and welcoming :). You do like balance as many of your inspiration pictures show. I would take the screen off asap because you would get the feel of no screen or a clear screen. Then, get the white paper out and cover up the bookcase and the off balance portion of the left side. I remember the blue tape that you used for imagining a different size doorway. The stone might look better with less of it. There is a grout paint, so would changing to a grey tone help? Someone else mentioned window on the left side. I agree and could you reduce the size on the right? A smaller and higher set of windows would enable putting in matching bookcases, like a couple of the pictures show. The brick removed on the left could fill in for brick needed for the smaller window. I sometimes think you’re channeling my design dilemmas. :) My husband and I have lived with a large red brick fireplace for 11 years. We talked about doing something sometime, but not a priority. Now it’s nice brick, a little rustic, gives nice warmth to it. However takes up almost a whole wall. Recently we talked about white washing it and letting a lil red come through. Then if we don’t like it, to either paint again, perhaps in a gray color or go crazy and add natural stone to it. It has a gas insert and in the PNW we use it all the time. Adding a rustic wood mantel would charm it up too. Anyway-I saved your blog to reply to and just got to it. I am as excited about your FP project as I am about mine! !